An efficient, reproducible and genotype-independent in planta transformation has been standardized for sugarcane using seed as explant. Transgenic sugarcane production through Agrobacterium infection followed by in vitro regeneration is a time-consuming process and highly genotype dependent. 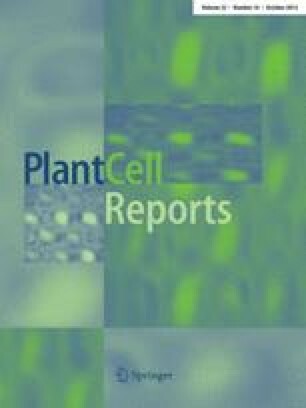 To obtain more number of transformed sugarcane plants in a relatively short duration, sugarcane seeds were infected with Agrobacterium tumefaciens EHA 105 harboring pCAMBIA 1304-bar and transformed plants were successfully established without undergoing in vitro regeneration. Various factors affecting sugarcane seed transformation were optimized, including pre-culture duration, acetosyringone concentration, surfactants, co-cultivation, sonication and vacuum infiltration duration. The transformed sugarcane plants were selected against BASTA® and screened by GUS and GFP visual assay, PCR and Southern hybridization. Among the different combinations and concentrations tested, when 12-h pre-cultured seeds were sonicated for 10 min and 3 min vacuum infiltered in 100 µM acetosyringone and 0.1 % Silwett L-77 containing Agrobacterium suspension and co-cultivated for 72-h showed highest transformation efficiency. The amenability of the standardized protocol was tested on five genotypes. It was found that all the tested genotypes responded favorably, though CoC671 proved to be the best responding cultivar with 45.4 % transformation efficiency. The developed protocol is cost-effective, efficient and genotype independent without involvement of any tissue culture procedure and can generate a relatively large number of transgenic plants in approximately 2 months. The authors are grateful to the University Grants Commission (UGC), Government of India, for the financial support [No.F. 2-3/2011 (Policy/SR)] to carry out the present work. The corresponding author is thankful to University Grants Commission (UGC), Govt. of India, for providing fellowship under UGC-BSR scheme. Subramanyam and Sivanadhan are thankful to the Council of Scientific and Industrial Research (CSIR), Govt. Of India, for the award of Senior Research Fellowship (SRF) for their doctoral research.